"Why didn't you make him leave? I told you not to let him stay around here. Why didn't you tell him to leave?" Watching someone go through the stages of grief gives a glimpse of their hopes and fears; it exposes the humanity that underlies their rational behavior. In this case, I heard the owner (I presume; second from right in the foreground) fluctuate between anger and acceptance. "Well, at least no one was hurt. We'll be out of business one or two days, but we can afford that." He pointed at the employee he had been interrogating as he continued, "But if this guy got hit…" His voice trailed off. "What's important is that nobody got hurt." According to other onlookers, the driver of this rental car got confused between the gas and the brake and plowed through the front of the store. 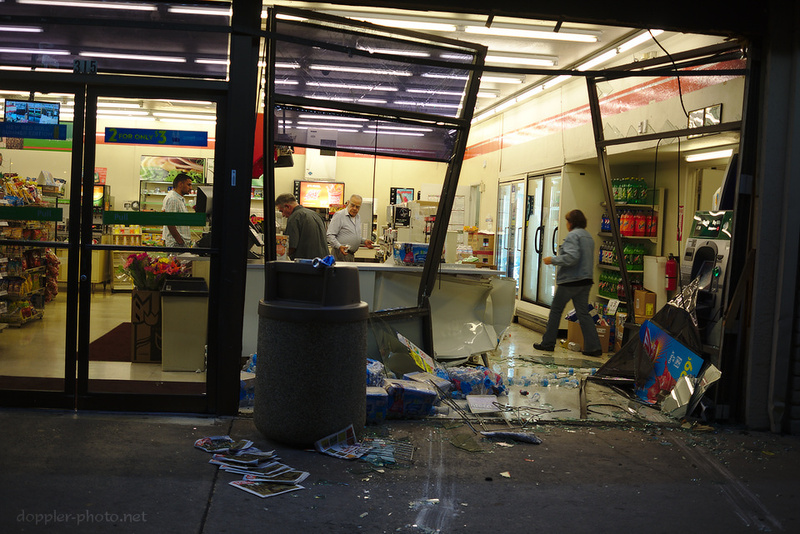 And according to the owner, the driver had taken to spending hours upon hours loitering around the convenience store. 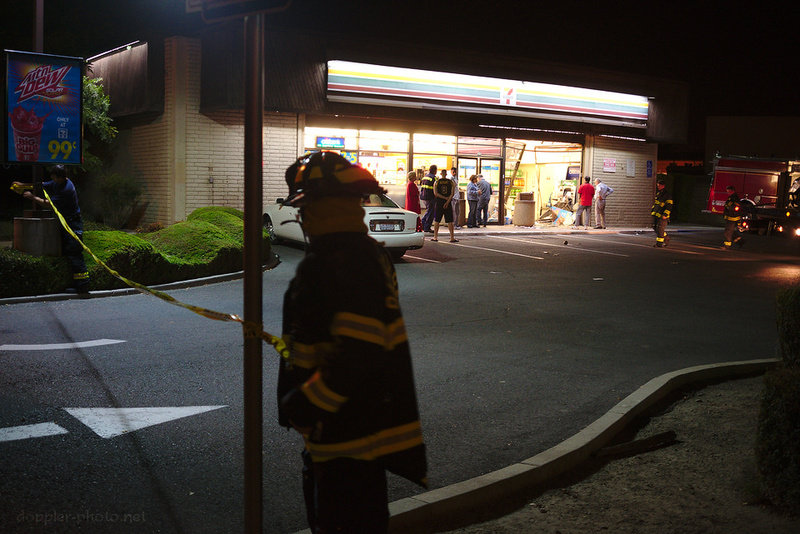 When I arrived, the occupants of the vehicle had gotten out, but the vehicle itself was still lodged in the storefront. 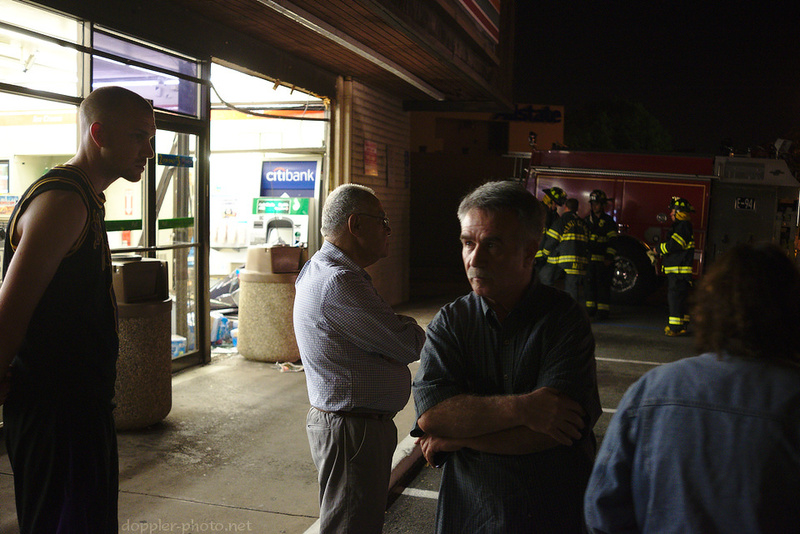 The tow-truck driver then used his flatbed truck to help disentangle the vehicle from the remains of the store's glass-and-metal façade. 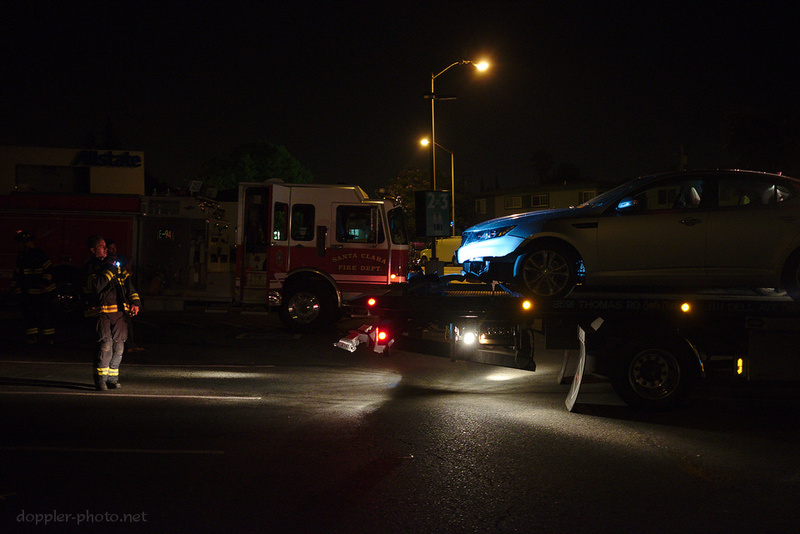 In the photo, a firefighter inspects the front of the car after it was loaded onto the truck. The group of fire-fighters managed the general safety of the situation. They cautioned onlookers from getting too close, and I believe they shut off power to the building as the car was extricated — in case any electrical lines were damaged during the incident. Afterward, they hung caution tape at the entrances to keep vehicles from entering the somewhat glass-strewn parking lot.